Loretta Allison, Spade and Seeds, and Christina Wenger, A Thinking Stomach, have set out to find gardeners who can teach us how to live better in our outdoor spaces. Home gardeners who have designed their own spaces—large or small—in ways that feed their homes and their spirits draw us to them. We figure we’re hungry to learn from them, so you might be also. Join us in our occasional series as we explore their spaces. 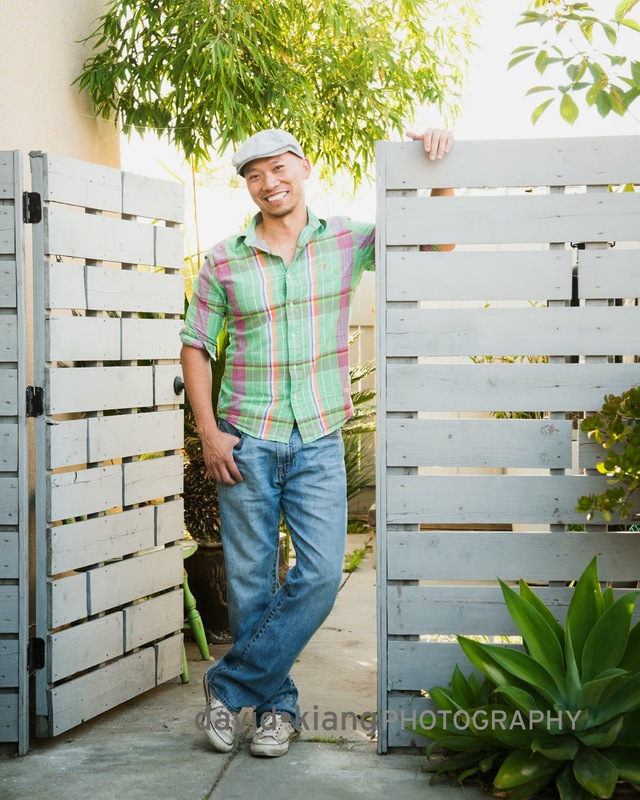 A peaceful man with an easy smile, Christopher Lee has been playing with plants since he was a kid. Somewhere along the way, he got distracted and ended up earning his masters in health administration. After just a few months in an office, he realized he had made a mistake, and left to return to plants. He’s been working as a freelance flower designer ever since, and in the past five years, he’s also been piecing together his own personal paradise. Christopher has turned blank apartmentlandia into a beautiful, food-producing, fish- and chicken-inhabited, manicured jungle. Before visiting Christopher’s home, I didn’t know jungles could be manicured. I learned the beautiful way. From the street, the apartment complex does not look like anything could be hiding behind it. But, as I walk into the center parking area, I notice concrete cut out of the parking spots, replaced with trees and spider plants. Between two young trees sits an old bathtub, planted with trailing herbs. And then, wait a minute, in front of the door of the bottom floor apartment is a large colony of dendrobium orchids in peak bloom, an Asian ceramic crock housing a mini-pond and water lettuce, pots of elegant succulents. The deeper into the complex, the more interesting it becomes. Christopher leads me through a gate and into his side yard, where spider plants never looked so good. They grow thick and lush under newly planted shade trees acquired from LA’s free tree giveaway. One tree will grow to shade a seating area Christopher has built out of a succulent wall garden and mid-century modern chairs his neighbor discarded. 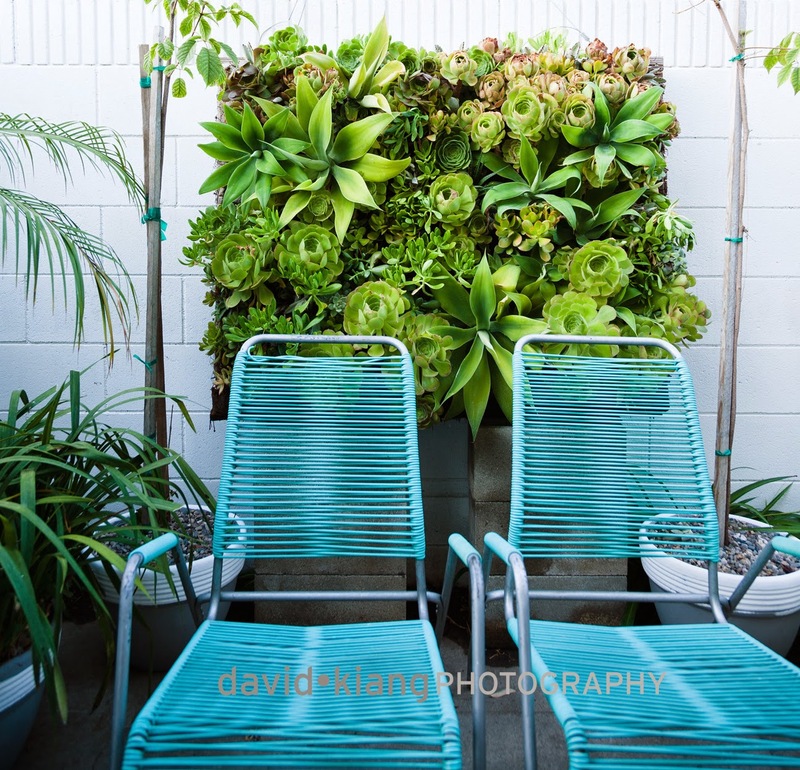 The turquoise caning of the chairs plays off the glaucous grays, lavenders, and lime greens of the succulents. Behind us, cuttings of succulents Christopher salvages from jobs, neighbors, and friends relax on a table, waiting for him to arrange them into the living sculptures that populate his garden. I hear the sound of water running. Just beyond us is another bathtub, this one full of small koi and water plants. I laugh. I didn’t expect a koi pond here, and certainly not one built out of an 80s-era bathtub, but it’s beautiful, and it works. The fishes’ tails write loopy poems of peace along the surface of the water. 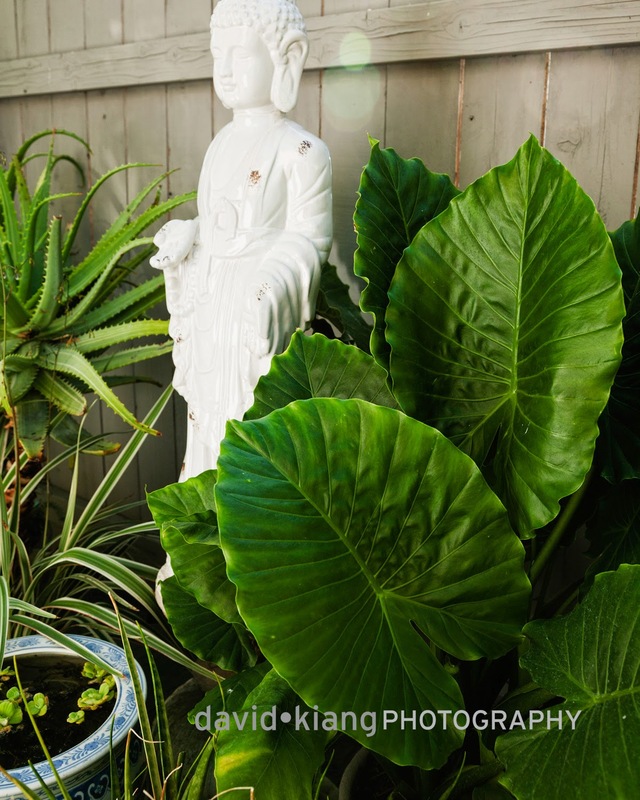 Beyond the koi tub, the garden opens up into a small backyard, where foliage creates layers of texture and color. The far edge is a carefully maintained bamboo forest, where Christopher cuts out any unwanted stalks and trims off the lower branches. He has tied the stalks with transparent fishing line to keep them at their most balanced angles. Below the lacey canopy of bamboo leaves are ferns, elephant ears, cymbidium orchids, and variegated spider plants. Green, green, green. Quiet. 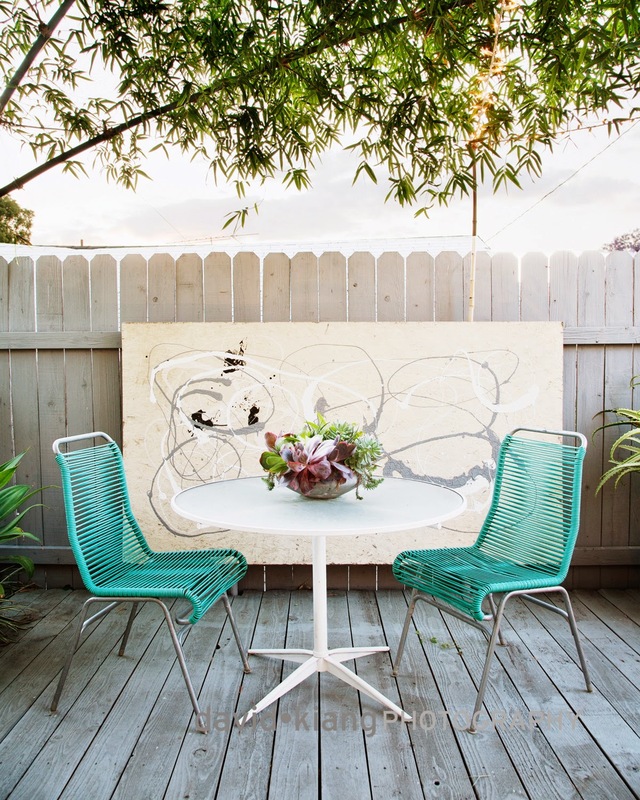 A gray wooden fence surrounds the yard, and Christopher built a slightly raised deck—painted the same color—out of big-box store fencing; he painted both from brown to gray. 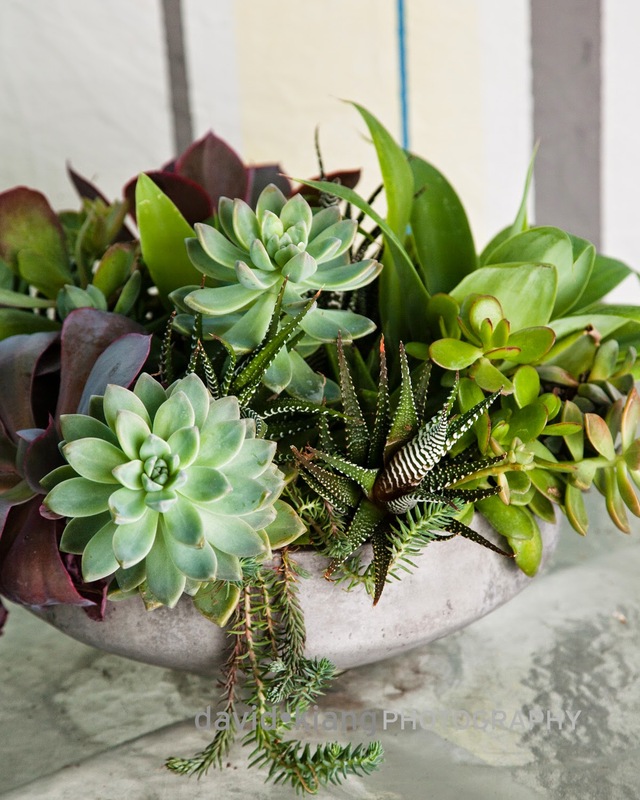 The gray softens the space, greening the greens and playing with the muted palette of potted succulents. He has more of his turquoise-caned chairs and a small table on the deck. Strings of white Christmas lights create a transparent ceiling that must provide a lightning bug glow in the evenings. Nearby, another large Asian ceramic pot houses a still pond of duckweed and guppies. But amidst the calm, there are more surprises. While I’m squatting to check out the bed closest to the back of the building, a shady, damp place full of food plants that I’m just beginning to parse out, Christopher, who has stepped away for a moment, returns carrying a bantam Brahma hen with a corresponding rooster scurrying behind him. The chickens live inside, but relax outside with Christopher in the backyard, where they scratch in the herb bed. He sets them down, and they walk confidently past me, right into the greens. The hen chuckles; the rooster looks alert. While I watch them dig and peck, Christopher explains what’s in the bed. He shows me the Asian greens he’s grown from a seed mix, and the mint, Vietnamese coriander, and Vietnamese fish mint that trail throughout, all grown easily from cuttings. These herbs are all very invasive, but as they live in this bed, surrounded by concrete, they can sprawl without becoming a threat. Large-leafed oxalis sends up its trios of emerald hearts. Red-stemmed chard quilts with color. Bronze fennel and an overwintered tomato provide floppy, filigreed height. The bed is a beautiful mess. Overall, hard work, discards, freebies, and a distinct and careful design sense have created this space. Christopher rescued many of his plants from his work and received cuttings of many others from friends. The bathtubs in the front and back are discards from the apartment building’s remodel; the outdoor furniture, the neighbor’s trash with a new slick of paint. Yet, there’s nothing cheap here—it’s all elegance. I could stay here in this peaceful place for hours, but I have other commitments, so go I must. My heart rate has slowed here; I’m refreshed. I’ve been graced by the calm of green, the presence of a joyful, generous gardener, and surprise. On that sunny, breezy day, I leave Christopher’s house with ideas and Vietnamese coriander cuttings. 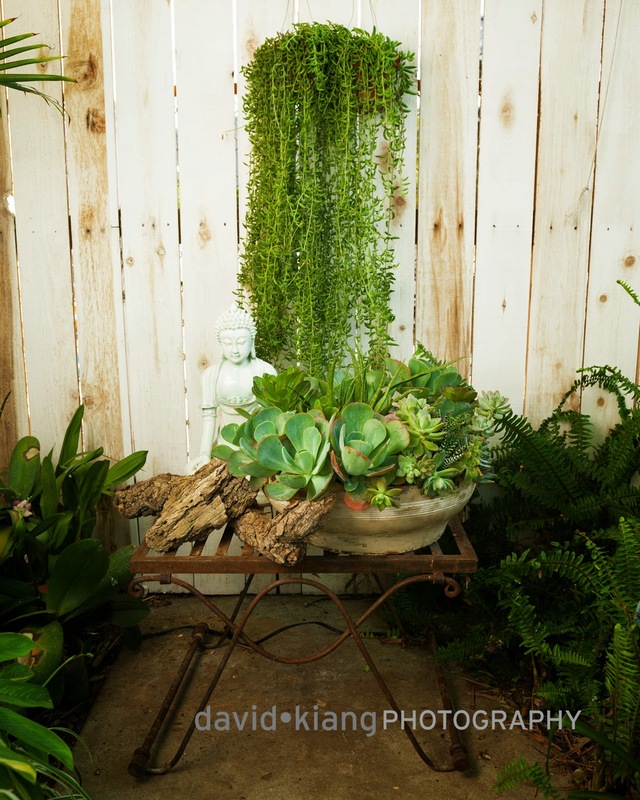 Ask your gardener friends for pass-along plants: Succulents, spider plants, Vietnamese coriander, mint, and fish mint grow easily from cuttings. Watch out though—mint and fish mint are invasive and unless they’ll be very contained, you may want to grow them only in a pot. Use what others won’t or can’t: Rescue from the side of the street objects that could be beautiful with a little elbow grease—tubs, pots, furniture. Gray is good: Have you ever noticed how green everything looks on a rainy day? It isn’t just because of the water, but also the color. 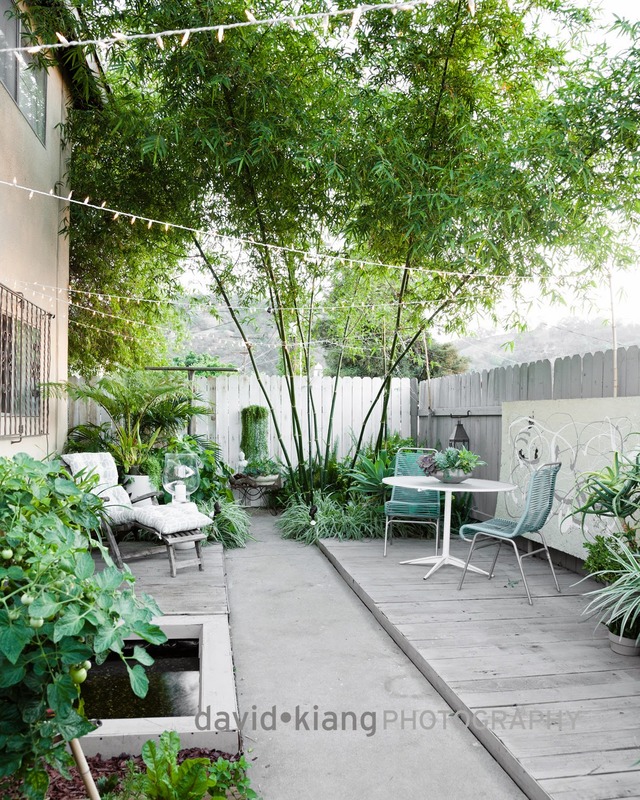 A backdrop of soft gray opens the space and plays well with both lush greens and glaucous succulents. Get your water fix by building a pond in a pot. Set water lettuce in it and a few guppies or mosquito fish; keep it in a shady spot so it doesn’t overheat, and monitor water levels. Gorgeous garden! One to return whether business or pleasure. Painting things grey is a good tip. It allows you to reuse junk wood you find in pallets. I don't know if Christopher did that but by designing his fence in shorter horizontal bands, I can see how that would work. Enjoyed this post so much! Thanks, Christina and collaborators! Some tips for my tiny balcony , perhaps . Without the hens , I think ! No pics of the chickens or "food" plants :( Very beautiful garden though. Great job -- everything one could want in a gardening article. David: Your photos really capture the atmosphere. Great work. Lori: Thanks! We enjoyed doing it. Great article. 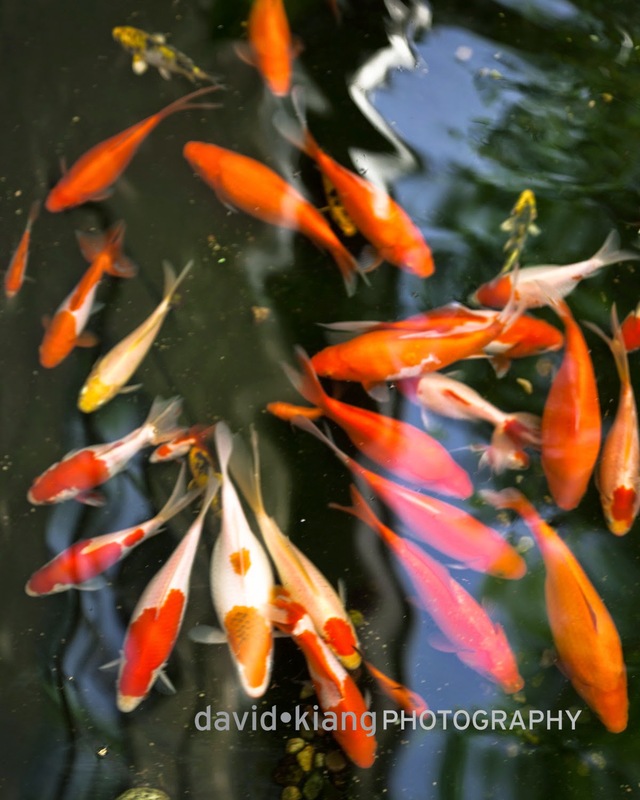 Didn't see the chicken though, very nice photos, especially the koi! Transformation to paradise for the apartment dweller, totes fabulous.